Thank you Mo for recommending this! This is finger licking good. Who ever thought the day would come when we Delhites could have cheap and super tasty Korean food DELIVERED to us! I thought I should be grateful for having Gung in the first place. They only do delivery and take away as far as I know. They charge Rs. 50 delivery charge and service but all worth it. What I really appreciated was even though its a small, simple delivery place, the quality of the produce was up to par and by no means questionable. We ordered all this food plus two pepsis and two more pieces of chicken you cant see for Rs. 1200, tax delivery included. Between four people. To be honest I could have eaten a chicken or two more but the others were full. *Sigh* The perils of my bottomless pit. Chicken Balls - Good not amazing but everyone else seemed to really enjoy them. Spiced minced chicken. Tasted more desi than Korean to me, a bit like Venky's chicken nuggets . A worthy snack none the less. Gimbap - Korean Sushi - Gim meaning seaweed. The main differences between gimbap and its better known sister the Japanese sushi is that it is usually larger. Japanese believe that it should fit comfortably as one bite where as the Koreans almost have a bigger the better attitude. Japanese sushi uses vinegared rice, where as Gimbap rice is usually unseasoned or seasoned with some sesame oil. The vinegar in Japanese sushi really does a lot though for that enhanced depth of flavour. Not usually served with any wasabi or soy but sometimes with some pickled radish or ginger. They use a lot of cooked ingredients and meat. Rib eye is a popular choice. Vegetables usually tend to be cooked or pickled. All the gimbap I have ever tried seems to be a mini meal in each bite (with egg, meat or seafood, vegetables pickled and not). 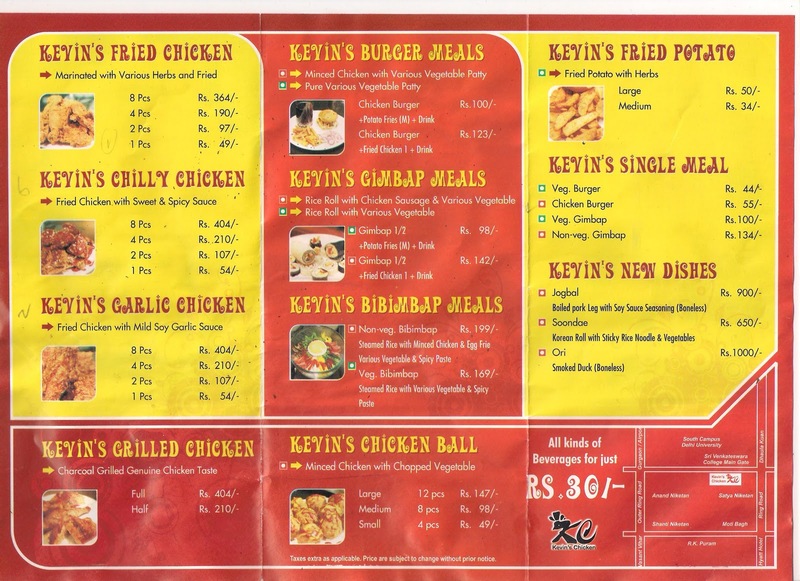 Kevin's offers two roll options = veg and non veg . No prizes for guessing we got the non veg . The roll includes chicken sausage, egg, cucumber, carrot, beans and the customary pickled radish. Final verdict not bad. Just remember you are eating Gimbap and not Japanese sushi. I did dip mine in soy and their sweetish vinegar, it didnt go as far as to be able to stand on its own like most really good gimbap. When I was away for college in a foreign land, every few days I would crave two things RICE and SPICE. I love love love rice and would undoubtedly eat every rice dish around, from Claypot sticky rice, Biryanis, to Khao Pad Gai and of course BIBIMBAP. First let me get over the name, its not a name you can just say once, the sound is strangely addictive, all I want to do is say it again and again. BIBIMBAP! This dish alone is a meal on its own. Bibimbap literally means "mixed rice" and it usually comes with a whole lot of different sauteed julienned vegetables, thinly shredded meat (usually beef), a fried egg, and that awesome Korean chilly paste (gochujang), all over a bowl of rice. Kevin's version came with carrots, cucumber, spinach and minced chicken on bed of sticky rice (10 points already for not using basmati!) I have had much better bibimbap but it was not bad at all. Bibimbap relies on the individual flavours of the vegetables and proteins rather than spices and sauces (mainly they just use sesame oil, some soy and little garlic). This one was a little lacking in flavour so I doused mine in their delicious chilly sauce (as close as they could get to gochujang I suppose), some soy, I even added some of the vinegar from the pickled radishes they served. Mmmm. Well, the place is called Kevin's Chicken (I added the Korean to explain better). 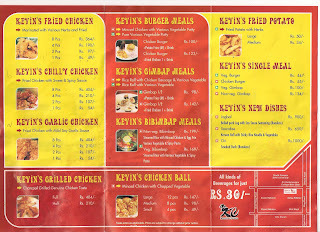 Our meal would not have been as satisfying without Kevin's delicious fried chicken. I am getting to the fried chicken. Patience crumpets. First, I must tell you about the grilled chicken. You can get the whole thing or half. We got half. Nothing out of the ordinary here. No secret rubs or marinades for sure. Just seasoned with salt and grilled. Was not dry at all but not divinely juicy either. Over all unless you have a thing for grilled chicken its quite skip-able. They mentioned it being marinated "with various herbs" and then fried. I could definitely not taste any herbs. But was still good. Surprisingly crunchy even after the delivery. Few pieces got a bit dry. Good they toss it in a soy and garlic glaze. Tasty! Basically if you want something super mild, but with a bit more flavour than the plain chicken, this can be your in between. Oh no please this is not anything like chinjabi chilly chicken. This is a thick sweet chilly sauce. Not very spicy. I think they made it from the same chilly sauce they serve with the food, but maybe with some added sugar as they thicken it. Sticky, sweet, spicy, scrumptious. Definitely my favourite. I am so happy to have discovered Kevin's. Everything was good some of course more so than others. I am all ready to order some more Bibimbap and fried chilly chicken, curl up on my couch with a movie and hope that time stops still. Comfort food for me, most definitely! Even though I am dying to try the whole smoked duck. If anyone does, do let me know what the verdict is. Contact Details: 011 65554088, 65575440/1 . 67 Satya Niketan. Opp. Sri Venkateswara College.